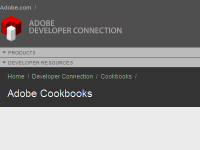 Adobe's Developer Connection has added Adobe Cookbooks, http://cookbooks.adobe.com/home. Members can post Adobe code for Flash, Flex, Air, ColdFusion, Dreamweaver, and other Adobe products. At this point the majority of the code shared is ActionScript and Flex code. Anyone interested can browse the cookbooks and no registration required. If you are interested in contributing code and interacting with other members, then registration is required or log-in with your Adobe account if you already have one. The site has community moderators, who monitor and facilitate discussions and also have the ability to improve the content. Tonight I was lucky enough to attend a Tony Bingham (ASTD's CEO) presentation at University of MD, Baltimore County (UMBC). A very engaging presentation about maximizing learning in the workplace and informal learning. He also shared several videos including the one below that I would like to share here. The executives in the video are Mike McDermott (T Rowe Price), Karie Willyerd (Sun Microsystems), and Walt McFarland (Booz Allen Hamilton). All too often people request training and have already determined the delivery medium they want. Their decision is usually for various reasons, such as convenience or cost, but not because it is the most effective way to teach the content. To borrow a phrase from a former boss, "ordering training is not like ordering pizza." It is crucial to step back and begin with a need analysis, identifying the audience, their training need(s), the learning objectives, etc. We must also conduct a content analysis. Only then can the best medium(s) of delivery be determined with confidence. It may be e-learning, classroom training or blended learning. In regards to using content analysis to make this determination, here is a very helpful article by Seung Youn Chyung and Armi Stephanie Treñas, published in Learning Solutions e-Magazine - Content Design for Performance-Oriented Reusable Blended Learning. You will need to log-in to access it. If you are not a member, joining as an associate member is free. The authors provide a practical approach to analyzing instructional content with the purpose of determining the best media to deliver the content. They focus on teaching content in the cognitive domain. Here is a rule of thumb they provide that I agree with "As a rule of thumb, it would be cost-effective to use self-paced e-Learning for delivering declarative knowledge and some of procedural knowledge that can be codified fairly easily. On the other hand, it may prove rather difficult, although not impossible, to facilitate the development of situated knowledge via e-Learning alone." If you want to get a better handle on determining what is best taught online, in the classroom or blended, this article is a great start. If clients are telling you the delivery medium instead of asking what the best delivery medium will be, follow the article's advice and you will save yourself a lot of time and trouble. And don't forget to tell them "ordering training is not like ordering pizza." U.S. Federal agencies are utilizing cloud computing and now have an app store, Apps.gov, which provides federal agencies and their staff with cloud computing applications. This includes business apps, productivity apps, social media apps, and cloud IT services. Here is the video Apps.gov provides as an introduction to cloud computing. Many corporations, and individuals, are still very hesitant to use the cloud, but hopefully the government's move to using the cloud will encourage others to use it. Especially if the government's use results in efficiencies, cost cutting, and being environment friendly. How will cloud computing affect education? The Don't Waste Your Time blog just added a post on this very question. And he gives the "good" and the "bad." You can also read how Google is playing a role in this. I continually added course as I find them. New categories are also added, as needed. The page contains plenty of great examples of e-learning and all are absolutely free, take a look. And if you have an e-learning course that allows open access, please let me me know and I will be happy to add it to the list. This month's Big Question at Learning Circuits is on working with subject matter experts (SME). First off, thank you Tony at Learning Circuits for using my suggestion as this month's question. In my opinion, working successfully with SMEs is the most challenging part of instructional design. I have written quite a bit about this subject on my blog. Here is a link to my posts with SME tags and my tips on working with SMEs (pasted below from a prior post along with an addendum). Inform SMEs of your expectations of them, allowing them to schedule their time and prepare for the tasks ahead. They will not just hand over some form of subject matter and that’s that. They will help identify training needs, learning objectives, etc. Also explain other expectations you have of them as it relates to the different phases of the course’s creation (proofing prototypes, drafts, clarifying subject matter, etc.). Keep your SME updated during the development stage. Development takes a significant amount of time and they may wonder, “Whatever happened to that e-learning designer?” Do not let SMEs forget about the project while you are busy creating it. Let them know of your progress. If possible upload what is available so far and call it a prototype. And get their feedback. I will add that recently I started a new position with the bank that acquired my prior bank/employer. One thing I learned during this transition is that when joining a new team of instructional designers it is very important to get a good grasp of how they approach working with SMEs. Although the team works well with SMEs some aspects of my approach created shifts in a process in which the SMEs had become very accustomed. However, using my new team's approach while introducing aspects of my own worked well, but I made it a point to explain to the SMEs why I was approaching certain tasks differently than they experienced in prior projects. SMEs can become very accustomed to specific ways of working with their instructional designers. So prep your SMEs well, especially if they already have pre-conceptions of the SME-instructional designer relationship. This is not to say one way is wrong or right, but it is what works well for each person and for the needs of the project.